I have never played the video game Assassin's Creed II, nor its predescessor, Assassin's Creed. However, as pointed out in the review of Altair, the protagonist of the original game, sometimes you buy a toy because you're a fan of a license or franchise, and sometimes you buy a toy because it's just a damn fine piece of plastic. Altair was a wonderful figure: cool design, nice sculpt, decent articulation, lots of accessories. 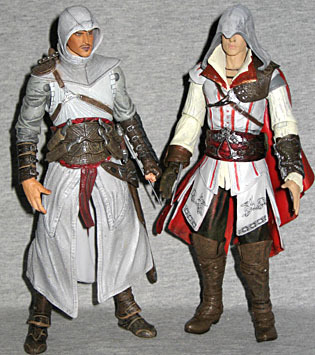 NECA, who made Altair, have produced two figures for the second installment of the game. 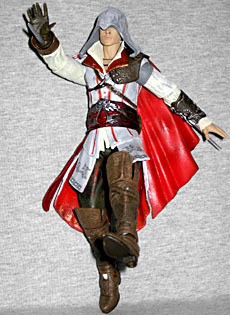 Both figures represent Altair's descendent, Ezio Auditore da Firenze. One (Memory 01) is simply referred to by the character's name, while the second figure, a darker repaint with retooled armor and other newly sculpted elements (Memory 02), is dubbed "Ezio - Master Assassin". 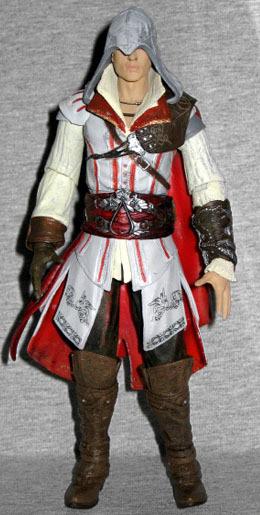 I chose the white garbed Ezio for a few reasons, one being that he was a closer match to Altair, and would look nicer when paired with him on the shelf. I will seek vengeance upon those who have betrayed my family, only to uncover a conspiracy bigger than I could have imagined... I am EZIO AUDITORE DA FIRENZE. I AM AN ASSASSIN. The truth is written in blood. So states the packaging bio. It doesn't tell too much about the game, and all I can really add is that it involves a secret society of assassins, lots of parkour across Renaissance architecture, and I think it's all happening in some guy's head. Onward to the figure! Ezio's design is basically Altair to the extreme. He keeps the white and red color scheme and the leather-and-loose-billowy-fabric look, but adds a wide double-collar, flared boot tops, and lots more fancy fillegree'd metal. Like Altair, he's got a hood, but while that was a fairly simple, tight-fitting affair, Ezio's is much looser and hangs much lower, obscuring most of his face. Despite the fact that only his nose, mouth and chin can be seen from most angles, the eyes, ears and even some hair are fully sculpted beneath the hood. His paint is done very nicely. It's strange the way paint can vary so much on different figures produced by the same company. Looking at, say, NECA's Berserker Predator or Fenrir Greyback from Harry Potter, you'd never think they were made by the same company that painted a figure like Ezio, or even the other figures in the Predators line. I suspect factories are largely to blame, but thankfully there's really nothing to complain about with Ezio. His main tunic is a light gray, with a a white undershirt and sleeves. There's red throughout the outfit, from the collar to the stripes on his tunic to the interior of his waistcoat and sash. Brown with a darker brown wash is used to simulate the leather on his boots, gauntlet, glove, belt and shoulder pad, and it does the job well. 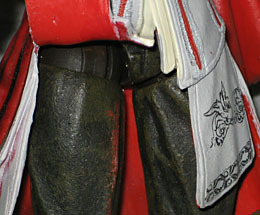 There are two different silvers used on the bits meant to look like metal; a shinier coat used for his buckles, studs, and blades while a darker, duller coat is given to his ornate belt buckle. Throughout the figure there are tiny details that really showcase the quality of the paintwork, from the clean patterns on the fabric to the tiny pink buttons on his vest. My personal favorite area is the linear design inscribed on his leather shoulder pad, which has been highlighted with a lighter brown. It's a very intricate, clean and complex paint app that really brings out the pattern, and it makes you wish this kind of quality could be found across the board on all NECA products. Ezio has mostly the same articulation as Altair, but it works a bit better due to Ezio's less limiting costume and a better overall integration of the joints into the sculpt. He's got a balljointed neck, balljointed shoulders, pegged and hinged elbows, balljointed wrists, a balljointed torso/waist, pegged and hinged hips, peg thighs, hinged knees, and pegged and hinged ankles. The elbows in particular have a much better range of motion than Altair's, due to the less restricting sculpt, and the hips are less burdened due to the lack of a long, stiff robe. 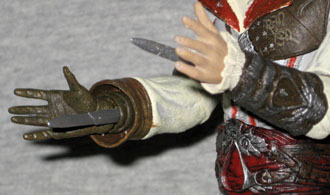 Since Ezio's belt is also slimmer, it allows for more range in the torso joint as well. It's not all perfect though. The thigh peg joints are positioned right under the hip joints (think late ToyBiz Marvel Legends figures). They're quite tight, while the hip joints move freely, so you end up moving the hips when you're trying to repose the thighs. Since the rubber waistcoat of Ezio's outfit limits access to the joints, it can be hard to get him posed the way you want him. Altair didn't have this issue, as the same range of motion was achieved not as a thigh peg, but as part of a pegged and hinged knee joint. While the scales tip slightly in Ezio's favor when it comes to articulation, Altair absolutely destroys his relative when it comes to accessories. Ezio gets two blades, and two blades only. 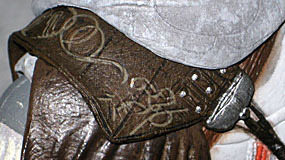 They emerge from the underside of each wrist, and the left is retractable (like Altair's) while the right is removable. Why they aren't both retractable is strange, but I suppose it makes sense to be able to have one blade completey "hidden". And that's it. He actually has one blade more than the "Master Assassin" Ezio, which is another reason I chose to get this version, but it's still sorely lacking. Now as I've said, I haven't played the game, but surely Ezio has access to more than two blades. Altair had a retractable blade, a huge sword, a wicked curved dagger, and four throwing knives, as well as several smaller sheathed knives on his shoulder and calf that were permanently attached sculpted elements. 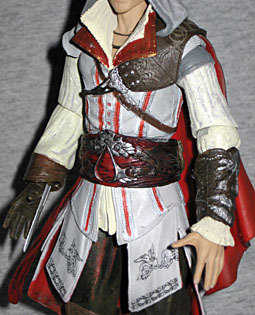 The accessories were one of the main reasons I purchased Altair, and to see Ezio get shafted is a real disappointment. Still, I can't be too mad at this figure. Great sculpt, awesome paint and nice articulation do a lot to win me over on this guy, and he looks great displayed next to Altair. I'm still on the fence about picking up the "Master Assassin" Ezio due to him having even less accessories, but I don't regret purchasing this Ezio at all, even with the lack of gear. Unlike NECA's T-1000 figures, it's not a case where you're missing out if you only buy one or the other.